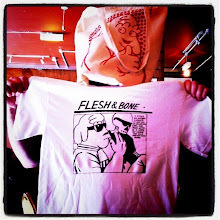 More Flesh & Bones next week as it happens. In the meantime, I did a skit skat happy slap on the latest Guy Ritchie talkie, RocknRolla. You can read it's pages in virtual reality format via this link on the MP site...chav it? I've got the taste in my teeth, hopefully another new one later today. Rappenin' is what's happenin' also, check out myspace.com/thefarttwins to taste "Something Creepin' Out of Me". Itsmountpleasant.com got a lil update last week too, fruits are fruityful. What time is it Trevor? new strip and rap coming tomorrow, happy mondays!